Congrats to Midia, who won Static by L.A. Witt! Static was released over the weekend by Amber Allure. Posted by Chris on Monday, June 27th, 2011, at 2:00 am, and filed under Covers, Reading. I am with you Mayhem. Noooooooooooo! Well said May, well said. A recent post from Tam..Celebratory Saturday! Agreeing with the kitteh: the gold medallion necklace is to lamely photoshopped. Beat out by a drive shaft, LOL! omg May are you practicing for a starring role in jaws or are you just extra sleepy? You know, I can see why he gets used over and over again. The man does have some abs going for him. A recent post from Literary Escapism..Sunday Surprise – New Blurbs! Poor Mayhem! However, the story gave me a good laugh! Mayhem – You and me both! That was aweful. But, you have to admit, the story took quite a turn. I didn’t see that “coming” at all! Sorry, couldn’t resist. Don’t hate me. Chris- Gunnar- there’s a butch name. I think May is in need of a naughty boy kitty post. His drive shaft stole her kilted lover? Yep, definitely the actions of a demon heart. OMG I have a pic of Hemi doing just as May is!!! 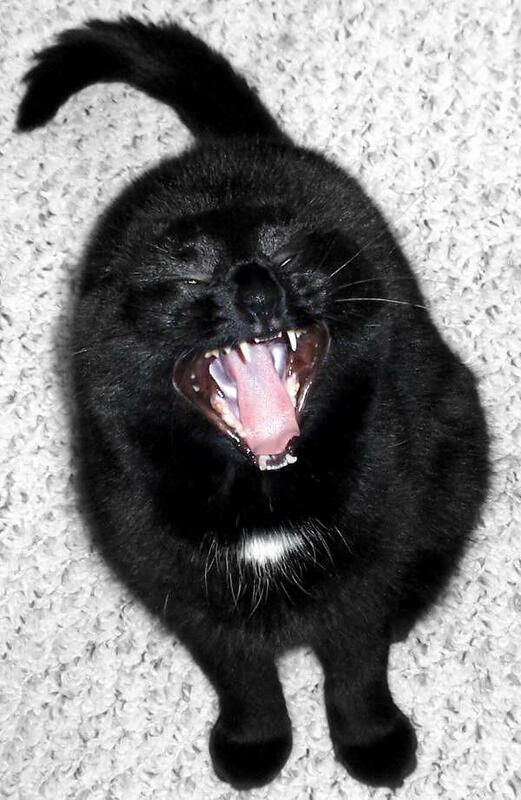 Except Hemi’s teeth arent as white…… I’ll post it on Friday. Poor Mayhem! Is she upset that the kilted lover is gone or about the slouchy guy in general? A recent post from lisa..Carnaby Skirt! Limited to a single pose that looks awfully uncomfortable! A recent post from janna..Swatched! Haven’t seen SOBJG in a while, hopefully he’s been getting treatment for that back condition he’s got – poor guy can’t stand up straight! Wow. That is a bit extreme. Poor guy obviously needs a brace. A recent post from Seanna Lea..a baitcon flavor retired… for now! It was the drive shaft that did you in, wasn’t it Mayhem? You could cut steaks with those abs. A recent post from Carrie#K..Pretty!! I’m so late in checking my favorite Monday post! I love that photo of Mayhem! And the caption is perfect. Both made me smile after a rather rough week. So I thank you both very much!! So the moral of this story is that drive shafts can’t be trusted?